This is a brand that definitely advocates for empowering yourself through skincare rituals with powerful, healthy, natural ingredients. Even better, they also empower the community of Berber women who harvest the backbone ingredient of their skincare line: argan oil. According to their website, Kahina Giving Beauty & founder Katharine L’Heureux are helping to fund a women’s cooperative, education for girls, and the purchase of goats. Women empowering women = hell yeah. I think Kahina Giving Beauty’s mission makes it a wonderful pick for holiday gifts, if you’re still in the market. But how well does the eye cream work? First: Kathryne and I LOVE argan oil. We’re working on a separate entry in which we can ooze joy and happiness about the oil for a full 750 words, but suffice to say, it’s our magic oil, providing a lot of moisture and making for more supple, firm skin. Argan oil on its own is great, but I prefer creams for the sensitive skin around my peepers, which is why I was attracted to Kahina’s argan-based eye cream. Creams feel more gentle and nourishing, and provide a great base for concealer (which I rarely leave the house without wearing. Dark circle city, y’all). 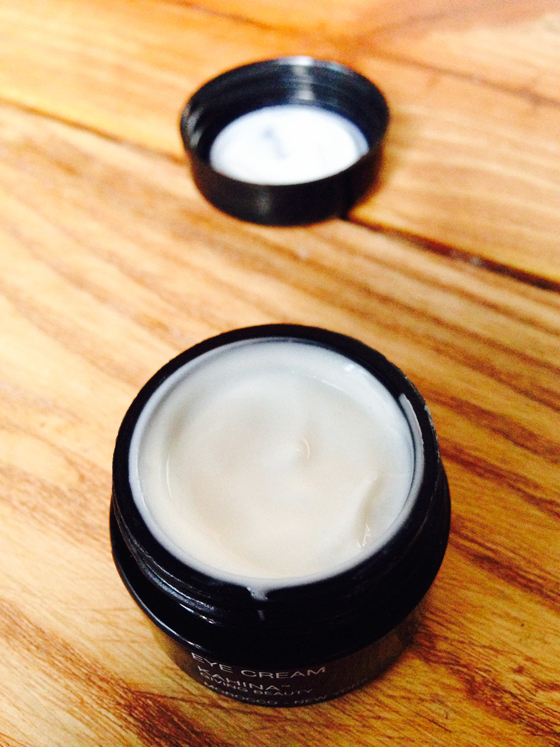 The eye cream is not as thick as others I’ve tried, which I appreciate: it feels weightless and is quickly absorbed. A little bit goes a long way here, so even though the tub holds just .4 oz. of product, it should last for many months. The scent is negligible, with a hint of freshness and sweetness. Other ingredients: apart from the argan oil, sea fennel and white and green tea are power ingredients in this product. Multiple studies that I found linked in Beauty Sage’s review of Kahina’s eye cream show that they repair cell damage and sooth inflammation. There are a few chemicals/ingredients in this eye cream that aroused suspicion on my part, however, Kahina’s disclaimer that 99.9% of the ingredients are derived from natural sources won me over. Kahina Giving Beauty asserts that the eye cream boosts collagen production, enhances moisture retention, decreases puffiness and dark circles, reduces the appearance of fine lines and fights cellular damage and aging. While I haven’t been using the product long enough to see many of these benefits yet, I can say that the cream is very nourishing. My eye skin really drinks it up. I’ve also noticed that puffiness around my eyes has diminished when I use the cream in the morning, which is a huge perk. I’m eager to check back in with you all in a month or so to discuss whether or not I’ve seen wrinkle reduction: cross your fingers for me! The Kahina Giving Beauty Eye Cream retails for $65 for 0.4 fl. oz. You can pick it up for 20% off thanks to a promo from No More Dirty Looks and Kahina Giving Beauty, valid through midnight tonight. Also, given the focus on Kahina’s brand and mission in this entry, I feel the need to clarify that I purchased Kahina Giving Beauty’s eye cream with my own funds, and I am not compensated or rewarded for reviewing their products. These opinions are my all my own – their mission just really resonated with me. I hope it does for you, too! aqua, argania spinosa (argan) kernel oil*, caprylic/capric triglyceride, cetearyl olivate, sorbitan olivate, glycerin, populus tremuloides (aspen) bark extract, betaine, cetyl palmitate, xanthan gum, p-anisic acid, sodium hyaluronate, hexapeptide-11, aloe barbadensis (aloe vera) leaf juice*, rosmarinus officinalis (rosemary) leaf extract*, helianthus annuss (sunflower) seed oil*, crithmum maritimum (sea fennel) extract, oryza sativa (rice) seed extract*, camellia sinensis leaf extract, olea europea (olive) leaf extract, saccharomyces cerevisiae extract, rhodiola rosea root extract, aroma. Have you tried Kahina Giving Beauty products? What do you think of the brand? I’m using the eye serum from Kahina. LOVE IT. I also have en route to me her new Fez body serum. I received a sample of it with my eye serum. Um, yeah… I’m in big trouble falling in love with a nearly $100 product, but OMGoodness. Um, yeah. BODY SERUM. And the smell is yum. Wanna check the clock on that NMDL deal? I was SO torn as to whether I should get the eye cream or the serum! ARGH. I saw that you mentioned it in your Friday post, have you noticed any immediate effects? Also, let’s start brainstorming ways to justify a $100 body serum immediately: value for money? Lasts forever? I went with the eye serum because I wanted the option to layer an eye cream if needed. Now in the A.M. I’ve found personally it’s not necessary. In the evening with this winter (fall) it has been sometimes neccessary to use both (I’m using Acure eye cream). Now, justify a $100 body serum, no. I treated myself for Christmas to the body serum, but I used Kahina’s 20% off code (early preview as I follow her on twitter & she follows me back) so it was just under $80 + free shipping. It would last a while only if you apply it over very wet skin. Do not apply on dry skin as you’d use a lot of the body serum. Oh, and no immediate effects (fine lines), but my eye area is so sensitive that many eye creams have actually burned/stung my under eye area. 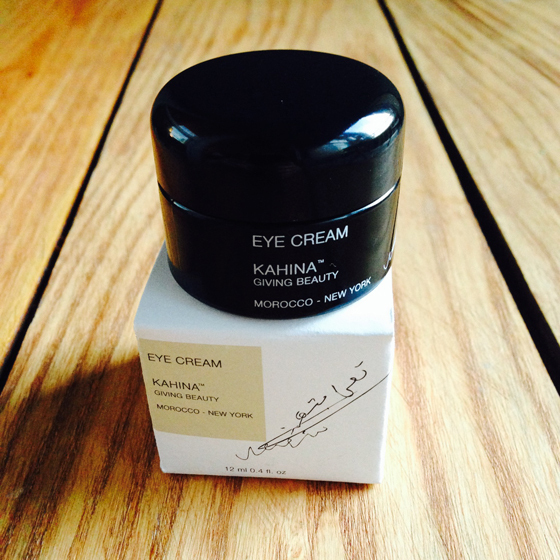 I’m glad to report that Kahina’s eye serum is nice and hydrating and great for those with sensitive eye areas! Let’s just say it’s helping this new 40 year old mom of 2 not have dark eye circles! I don’t have too much to conceal so that’s a plus. Thanks for all this feedback, Paula! I’m keeping the serum on my wish list after reading your description. I nabbed the eye cream for 20% off on Beauty Sage which made me feel a bit better about splurging on it – I can be a bit of a cheapskate so that definitely helped me reconcile a $60 eye cream purchase, haha. ENJOY that body serum to the last drop! Splurges are necessary sometimes – and you got a deal! Ah, creamy cleansers! It’s been a while since I used one – I just looked at your review on your blog and Kahina’s sounds lovely. It seems across the board that Kahina’s products are really silky and nourishing, it’s so hard not to want them all. I will definitely post a follow up in 2014! I should probably take some “before” photos this week…nothing I love more than documenting my dark circles & crow’s feet, ha! Well ok, I am taking the plunge! Thanks year-end bonus…and thank you Jennifer for a lovely blog that has sent me down a wonderful rabbit hole of natural skin care exploration. Here’s to a healthy 2014! *CLINK* I’ll cheers to that, girl! Thanks so much for checkin’ out the blog, Emily! Let me know what products you pick up.